We’re pleased to introduce to you new faces of the FUMON double-edged series made by Takeshi and Takayuki Iwai who eagerly pursue unique Japanese traditional hand-made-process. 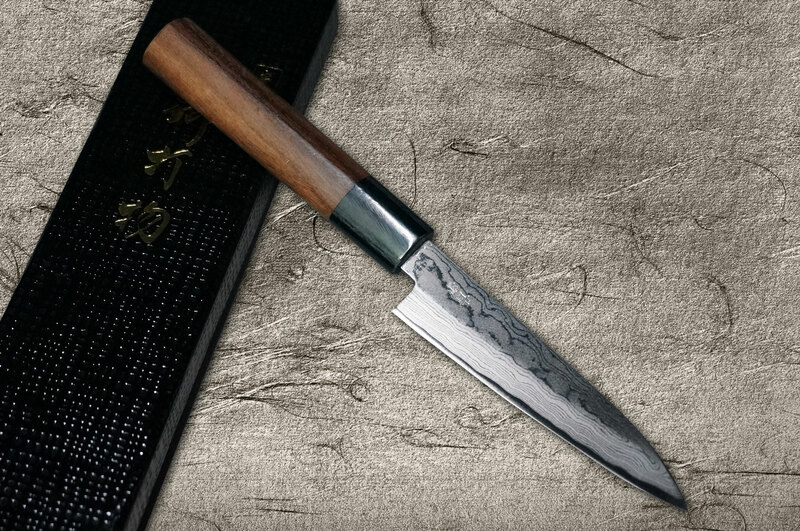 On the surface of a blade are the beautiful “Fumon” or “Wind Ripples” Damascus patterns which come from forged many layers of iron and steel. The material is known as prime high carbon Aogami No.2 steel, specifically developed for tools and knives, and has highest wear resistance and toughness because of special hardness. In addition, their knives are made to be light and well balanced, so that the center of gravity of the knife is in the hand and you can have them easily. The handle is made of Red Sandalwood for beauty and durability, which gives us feelings of luxury. 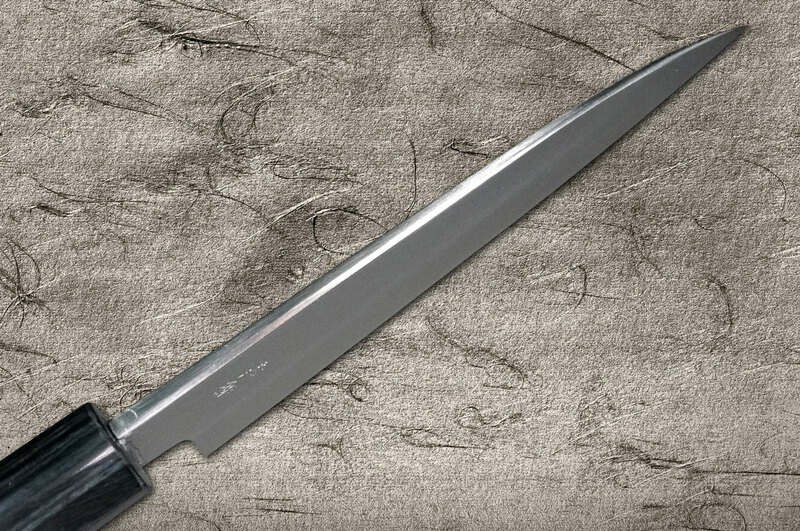 The IWAI blacksmith company has been devoted to manufacturing knives for approx. 80 years from in 1939. 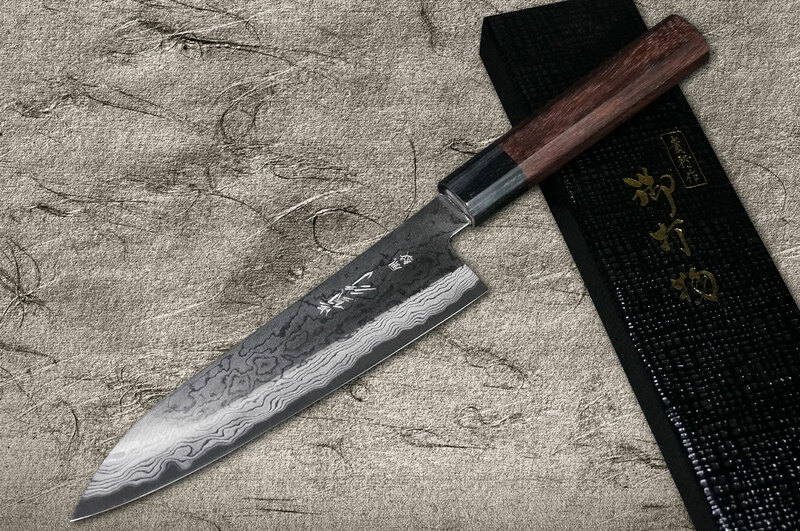 One of the promising blacksmith, Takeshi Iwai, received the certification of the youngest Traditional Craftsman of cutlery production industry in his 35 years old, in 2006. His father, Takayuki Iwai, had also received the certification in 1994. It’s the first thing that two generations are certified. It’s notable that they never use machines for mass production but their skilled hands, because they believe machine-made knives are often inferior than hand-made ones in quality.